Surrounded by ice, commercial fishing boats are docked in their slips after more than a week's worth of frigid weather froze the harbor in Lake Montauk in Montauk, New York, on Sunday, Jan. 7, 2018. 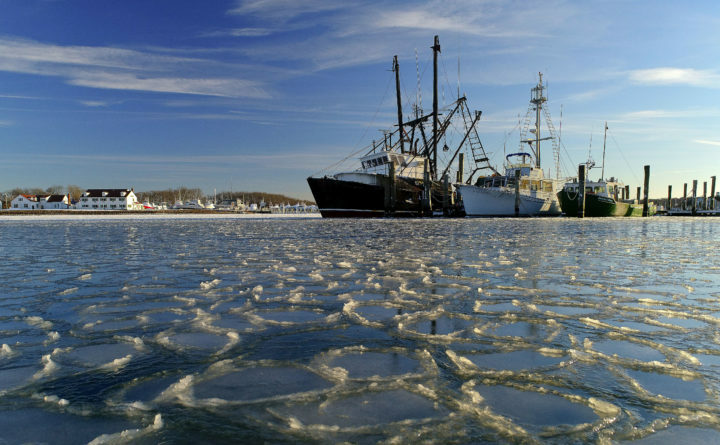 Only a few commercial boats remain in Montauk harbor during the winter months fishing for species such as porgy, tilefish, monkfish and black sea bass. Even after winter storms left East Coast harbors thick with ice, some of the country’s top chefs and trendy restaurants were offering sushi-grade tuna supposedly pulled in fresh off the coast of New York. As part of its reporting, the AP staked out America’s largest fish market, followed trucks and interviewed fishermen who worked on three continents. During a bone-chilling week, they set up a camera that shot more than 36,000 time-lapse photos of a Montauk harbor, showing no tuna boats docking. At the same time, AP worked with a chef to order fish supposedly coming from the seaside town. The boat listed on the receipt hadn’t been there in at least two years. Reporters also tracked Sea To Table’s supply chain to fishermen abroad who earn as little as $1.50 a day working 22-hour shifts without proper food and water. A century ago, small-scale fisheries dotted America’s coasts and fed the country’s demand for seafood. But as time passed, overfishing, strict government regulations and outsourcing to developing countries changed the industry, making it nearly impossible for local fishermen to compete. The U.S. seafood market is worth $17 billion annually, with imports making up more than 90 percent of that. Experts say one in five fish is caught illegally worldwide, and a study last year by the University of California, Los Angeles and Loyola Marymount University found nearly half of all sushi samples tested in L.A. didn’t match the fish advertised on the menu. The Montauk tuna arrived with a Sea To Table leaflet describing the romantic, seaside town and an email from a salesperson saying the fish was caught off North Carolina. But the boxes came from New York and there was no indication it had been landed in another state and driven more than 700 miles to Montauk. A week later the caterer ordered the Montauk tuna again. This time the invoice listed a boat whose owner later told AP he didn’t catch anything for Sea To Table at that time. Some of Sea To Table’s partner docks, it turns out, are not docks at all. Their seafood was advertised as “just landed” from wholesalers and retailers like Santa Barbara Fish Market — which also has imports — and Red’s Best in Boston. Both collect seafood at harbors and companies up and down their coasts. Sea To Table also promoted fresh blue crab from Maryland in January, even though the season closed in November. In addition, the company said it never sells farmed seafood, citing concerns about antibiotics and hormones. But red abalone advertised from central California are actually grown in tanks — it’s been illegal to harvest commercially from the ocean since 1997. Rhode Island and Washington state also supply aquacultured seafood, such as oysters and mussels. However, days later, he said he decided to drop aquaculture from his business because it contradicts his “wild only” guarantee. Eric Hodge, a small-scale fisherman from Santa Barbara, said he considered partnering with Sea To Table a few years ago. He quickly changed his mind after seeing canary rockfish on the distributor’s chef lists when the fish was illegal to catch. He also learned Sea To Table was buying halibut from the fish market, which relies heavily on imports. He said he spoke to the company about his concerns. The New York Times, National Geographic, Bon Appetit magazine and many others singled out Sea To Table as the good guys in a notoriously bad industry. Larry Olmsted, author of the bestselling book “Real Food, Fake Food,” recommended it as an answer to fraud in a Forbes article. Sea To Table’s products are sold in almost every state, reaching everywhere from Roy’s seafood restaurants to Tacombi taco chain. It can be found at eateries inside the Empire State Building in New York and Chicago’s O’Hare airport, direct to consumers from its own website and even on Amazon for home cooks to order. In addition, more than 50 college campuses such as Yale, Ohio State and the University of Massachusetts have signed up. So have some of the biggest make-it-yourself meal kits, including Home Chef and Sun Basket, a rapidly growing market that Sea To Table says generates a third its revenues. AP’s investigation began with one of Sea To Table’s nearby suppliers. Located on New York’s eastern coast beyond the posh Hamptons, Bob Gosman Company opened in Montauk as a mom-and-pop clam shack more than six decades ago. Gosman’s gets most of its tuna along with other species from a place in the state where fish can always be found, regardless of the season: The New Fulton Fish Market. The nine-acre refrigerated warehouse just outside Manhattan is the second-largest facility of its kind, moving millions of pounds of seafood each night, much of it flown in from across the globe. In the early hours, often between 2 a.m. and 4 a.m., boxes of fish bearing foreign shipping labels from all over the world were arranged into piles with “Gosman” scribbled across them in black marker. They were later hoisted onto a waiting truck with the same name. After a three-hour drive east, the AP watched the loads arrive at the company’s loading dock in Montauk, just as the sun was rising on the tip of Long Island. The tuna, swordfish and other species were then ferried inside Gosman’s warehouse. They came from Blue Ocean in Brazil, Vietnam’s Hong Ngoc Seafood Co., and Land, Ice and Fish in Trinidad and Tobago. Occasionally, boxes showed up from Luen Thai Fishing Venture and Marshall Islands Fishing Venture, part of a Hong Kong-based conglomerate that’s a major supplier of sushi-grade tuna. Despite recent conservation partnerships, Luen Thai has a checkered past, including shark finning and a bribery scandal that resulted in the jailing of a former Cook Islands marine resources minister in 2016. Eventually, with Dimin’s blessing, Gosman said he started getting fish from as far away as North Carolina and trucking it up to New York. They stopped that arrangement in March. Gosman said it wasn’t profitable. Dimin said they wanted to avoid the “complexity of communicating” their sourcing. Meanwhile, in the dead of winter, AP had turned to a chef to order $500 worth of fish on their behalf. Sea To Table provided a receipt and verbal assurances that the seafood — which arrived overnight in a box bearing the company’s name and logo — had been landed in Montauk the day before. The invoice even listed the “Standin Up” as the boat that caught it. But the vessel’s owner said it was in another state at the time, hundreds of miles away. Bryan Gosman said they keep Sea To Table’s fish separate, but acknowledged there’s always a chance some imported tuna can slip through with domestic. The investigation didn’t end in Montauk. One of the boxes in Gosman’s stack at the Fulton fish market was stamped with a little blue tuna logo above the words “Land, Ice and Fish,” out of Trinidad and Tobago. This is where the AP traced companies in Sea To Table’s supply chain to slave-like working conditions and the destruction of marine life. Though it’s nearly impossible to tell where a specific fish ends up, or what percentage of a company’s seafood is fraudulent, experts say even one bad piece taints the entire supply chain. During the investigation, reporters interviewed and obtained written complaints from more than a dozen current and former Indonesian fishermen — including Sulistyo — who were connected to companies in Sea To Table’s supply chain.